RPM 3 Carbon- Round table w/Carbon fiber arm in gloss black, red or white w/$450 Sumiko Blue Point #2 $999. 6Perspex DC, Turntable w/ clear acrylic plinth, sub-chassis system made of Corian® suspended by three height adjustable opposing magnet fields. Also a bonded MDF platter with vinyl mat, a threaded record clamp, adjustable cone feet. A new 9" tonearm, the 9cc Evolution, incorporates a conical carbon fiber arm - $1,799/ $1999 with $500 Blue Point Special EVO III cartridge & $99 Connect-iT tonearm cable. XTension 9- Affordable state of the art table in 5 lacquer colors. $2499/$2750 w/$450 Bluepoint #2 cart. XTension 10- (Above) New affordable super table with superb $1300 Project 10cc Evolution 10" carbon fiber arm, 12 pound platter, mass loaded floating sub chassis, balanced sandwich platter and electronic speed control. $3499/ $3999 with $1250 Sumiko Blackbird cartridge. Available in piano black, mahogany or olive. With the Stream Box S2 Ultra Project has designed a completely new product in the streaming world. It features never seen control scenarios and unprecedented audio performance. Its main goal is to be a universal device that can get any USB DAC into the network, upgrading your favourite high-end DAC with modern and future proof streaming capabilities. With the gaining ground of internet streaming services, such as TIDAL or Spotify, Audiophiles interest has shifted towards network enabled devices. Many great sounding products though do not offer any network ability, either because they are too old or their main focus was not on streaming. The solution has often been to replace them with a new and modern device, stream audio via Bluetooth or to comprimise and use a smartphone or tablet via their analogue ouput to feed active speakers or amplifiers. There never was a really good solution for the consumer. Untill now. Stream Box S2 Ultra closes the gap, it offers modern connectivity with its network inputs and USB A output. Its USB output is perfected for audio signals. 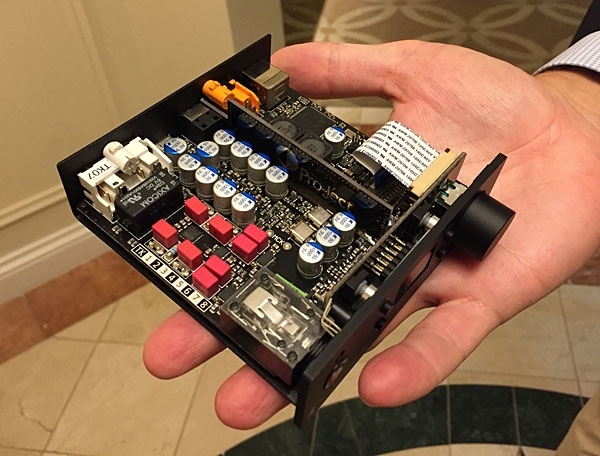 It uses a dedicated internal power supply and only top audiophile grade components. You won‘t run into file-support issues, as Stream Box S2 Ultra acts as a network bridge, bypassing the files directly to your digital to analogue converter. Since most DACs only have one USB input, Project designed Stream Box S2 Ultra also to be a USB detox device. Simply connect your PC to the micro USB input of the unit and connect your DAC to the audio output. This way you can clean the noisy signal of your PC, while enjoying your music with it. The new remote control iOS and Android App is based on an opensource project and has a large community behind it. This guarantees full support and future improvements. Stream Box S2 Ultra: feature galore! Stream Box S2 Ultra is fully remoteable via smart devices and a regular web-browser. It offers support for the most popular streaming services: Spotify and TIDAL. Both services offer you an endless amount of music guaranteeing that you never run out of music to listen to. By implementing Shoutcast, Project also give you the option to listen to various internet radio stations. You can listen to your favourite radio shows, the news and discover new channels from all around the world – with just a few clicks. The back-sided HDMI video output lets you connect your monitor to the Stream Box S2 Ultra. It will then show you the graphic user interface, ready to act on your commands. With the implementation of Shairport Project as even able to give the iDevice users out there another possibilty to send data to Stream Box S2 Ultra. There are two USB inputs on Stream Box S2 Ultra, one front sided and one back sided. Both give you the possibility to connect an external harddrive to the unit. Via one of the various control scenarios (App, Webbrowser, external monitor) you can pick from your own selection of audio. The file system support goes up to PCM 32bit / 352.8 kHz and DSD256. Pro-Ject is a big supporter of the Roon software so the Stream Box S2 Ultra is Roon Ready. This way you can simply pick your Stream Box S2 Ultra in the Roon interface and send bit-perfect audio streams to it over your network. The whole audio circuitry design is ultra low noise and ultra linear with very low output impedance to avoid any negative interference with cables or pre-amps. The optional outboard Power Box RS power supply at only $499.00 makes it even better. The Pre Box RS is a reference-grade 2-channel preamplifier featuring a fully balanced dual-mono design with a vacuum tube based output stage. The circuit design is both ultra quiet and highly linear using no global negative feedback. Operating in pure Class A the Pre Box RS is capable of producing stunning musical realism from any line level source. There are numerous source connectivity options using either two pairs of balanced XLR's or the three pairs of single-ended RCA jacks. High-quality component parts are used throughout including low ESR capacitors, rugged relays, reliable dip-switches and a motor driven Alps potentiometer to control output level. All circuitry is encased in a heavy and rigid aluminum chassis that is mechanically constructed using anti-microphonic techniques. A robust highly regulated and filtered outboard power supply delivers ample voltage for impressive dynamic capabilities and an upgraded power supply is also an option. An IR remote control is supplied. Pre Box S2 Digital marks a new era for Pro-Jects S-series components, for the very first time They are using a dual mono configuration with the highest class D/A converters of ESS Sabre, their flagship DAC chip, that ensures highest class audio in a small and affordable pack-age. This DAC is capable of high resolution audio up to 32bit 768kHz PCM and DSD512! Pre Box S2 Digital is also the very first of our devices to support hardware MQA unfolding. It’s also the premiere of our proprietary Optimum transient digital filter and our pro-prietary clock circuitry design. Digital audio is the art of time, with the new proprietary clock design we have managed jitter rates of unrivalled 100 Femtoseconds, this easily outperforms many renowned and respected audiophile clock generators! With organic polymer capacitors and thin film mini MELF resistors Pro-Ject was able to create a tiny device that will blow away even much bigger components for a much higher price. With a total of seven digital filters the sound can be shaped precisely to the listeners lik-ing. Pre Box S2 Digital is fully remoteable, it can also control the playback software of a computer. You can use Play, Pause, Forward and Rewind straight with your Pre Box S2 Digital! "At $399 the Pre Box S2 Digital is one of those all-in-one solutions that defines what a typical 2018 digital audiophile might be looking for. Roon Tested, full MQA unfolding, a low noise floor, easily transportable and a very likable tonal presentation with a very modern DAC chip solution inside. This is one well designed, feature-heavy little box and it will sit very nicely indeed right beside your PC either at home or in the office." PCs. On the other hand, USB hook-up means the S2 is still a portable option for laptop users, and it doesn't need a battery. For the price, its sound performanceis impeccable, combining clarity and precision with an attractive warmth and impressive sense of space."